“Get that evil, oily, smelly, loud machine out of my garden!” This was the response I got from a dear friend and gardener, as I pointed my 1967 Gravely tractor with the “Power Plow” attachment –– a tool that can only be described as a food processor for soil–– towards the task of turning her vegetable garden one spring. Here, I thought I was being such a nice guy. She was a soil-studies major at the University of Maine, and lord help you if you called it “dirt”. My friend’s contention that the grease, oil and airborne pollutants coming out of my venerable old tractor is bad for her plants is far from unfounded. Small engines have virtually no anti-pollution and emission controls required. As a result, “A 2001 study showed that some mowers emit the same amount of pollution (emissions other than carbon dioxide) in one hour as driving a 1992 model car for 650 miles (1,050 km).. Another estimate puts the amount of pollution from a lawn mower at four times the amount from a car, per hour” (from Wikipedia) – not to mention the noise. So what are the alternatives when power tools are necessary in the garden? 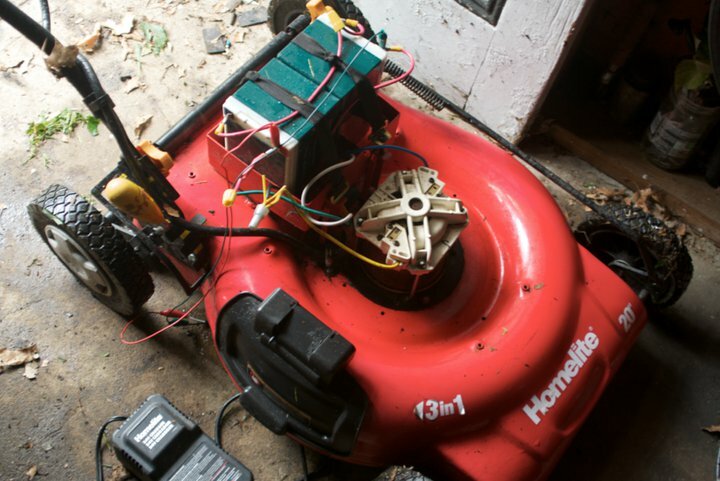 The mower above was found on Craigslist for free – a little electric mower that wore out its batteries. I picked it up and tossed some of my old scooter batteries in, and voila- I’d saved the thing from the landfill, used my old scooter batteries for something worthwhile, and got myself a cordless electric lawnmower. This got me to thinking —I know, a dangerous thing— how much of a normal compliment of yard and garden equipment could be electric, or could be converted to electric? I’ve been using a corded electric lawnmover and weedwacker for years. From the perspective of noise-control alone, it’s a wonderful alternative. An electric lawnmower simply makes a whirring sound, and depending on how close your neighbors live, you can run it in the early hours of a weekend morning with no fear of waking the entire neighborhood. 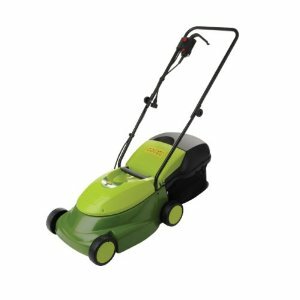 For a small lawn or garden, and with a little practice and observance of the prime rule of electric corded lawnmowing (always turn the handle towards the cord source, never away), it’s a perfect solution. You don’t get how much the smog coming out of a mower affects you —personally— until you use an electric machine, and begin to notice that you can breathe, your ears don’t ring and your clothes don’t stink. But what else is out there? 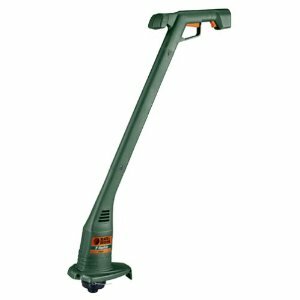 A simple search for “electric garden tools” reveals a staggering array of stuff: from lawn mowers and string trimmers right on up to electric chippers, log splitters, chain saws, rototillers, and the list goes on. 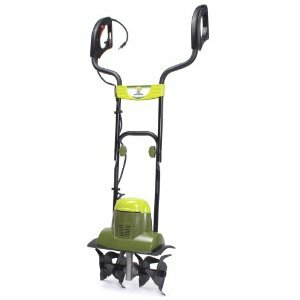 Many of the tools are for a small urban or suburban lawn or garden, and some of them are pretty robust. Most of the big tools are corded, so you’re limited to using them within 100 feet or so of your outlet, and this does take some getting used to. But, hearing the birds singing while you’re mowing the grass is —well, to coin a phrase— priceless! 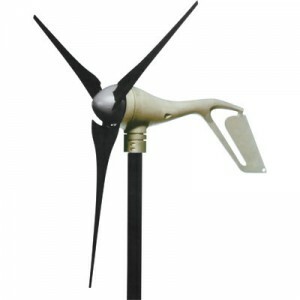 Battery powered tools are also an option, and in terms of charging, solar kits are getting remarkably affordable – so are wind turbines. And, the stuff can be bought at places like Northern Tool. Interested in further exploring the possibilities of electric power tools, battery charging systems and other environmentally-friendly garden and home solutions? For more information and specifics on solar, wind and battery technology (and electric motorcycles too! ), visit Ted Dillard’s awesome blog, The Electric Chronicles, for more details. You are currently browsing the Electric Garden Tools category at The Gardener's Eden.